Once again, I’m pleased to pass along a blog written by my co-leader for a Highlights Foundation workshop. 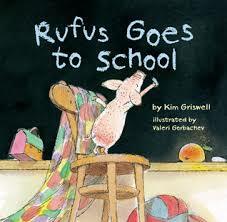 Kim Griswell is both an author (most recently of the picture book Rufus Goes to School, which my son Ashton loves!) and an editor (Portable Press), and she’s a fabulous teacher. I’ve been privileged to co-lead workshops on The Hero’s Journey and Mastering Setting with Kim, and now we’re combining forces to offer Finding Your Voice. Check out Kim’s blog, posted this week on the Highlights Foundation website. And please, if you know of someone who might benefit from this workshop (October 12-15, 2014) spread the word! Much of what passes across an editor’s desk has a dull sameness. There may be nothing really “wrong” with the writing. It’s competent, but it falls under the category of NNUTS (Nothing New Under the Sun). Nothing new in the ideas, nothing new in the characters or plot, and nothing new in the writing. Beginning—and sometimes experienced—writers often submit manuscripts that do not have unique voices. Our greatest writers write from their guts, from their truths. They dig deep until they reach a vein within themselves that is pure gold. They tell stories that only they can tell, as only they can tell them. That, in a nutshell, is voice. It often takes years for a writer to find his or her authentic voice. Voice is not simply the way a writer says things; voice reflects a writer’s unique way of viewing the world. Every editor is hoping to pick up a manuscript and find an original voice. That’s why finding your voice should be on the top of your writer’s to-do list. Get a journal with a key—one of those kid ones. Write things in there that are so honest you have to keep them under lock and key for fear anyone will read them. Write a page a day. Come on—you can do it! If you can’t stop yourself after one page, keep writing. Use photos from your childhood as writing prompts. Write from the voice of who you were in (or at the time of) the photos. Blog. Much like a vocalist’s morning scales, this kind of “conversational” writing will help to loosen your writing voice. Finding your voice will help your work rise to the top of the same-old-same-old manuscripts piled on editors’ desks. And that’s a goal worth pursuing! If you’d like a jumpstart on finding your voice or want to expand on these practices, I hope you’ll join K.L. Going and me for Finding Your Voice, October 12-15, 2014.